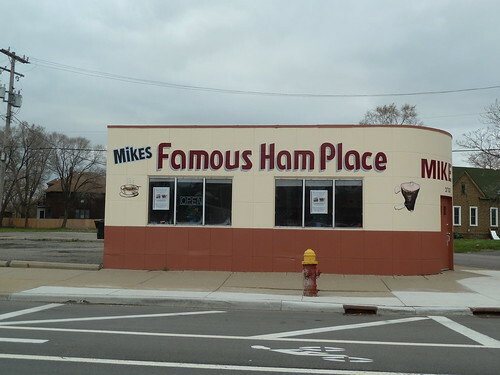 Here’s a quick, photo-heavy recap of a couple of more things eaten while on a very short Detroit-area trip. 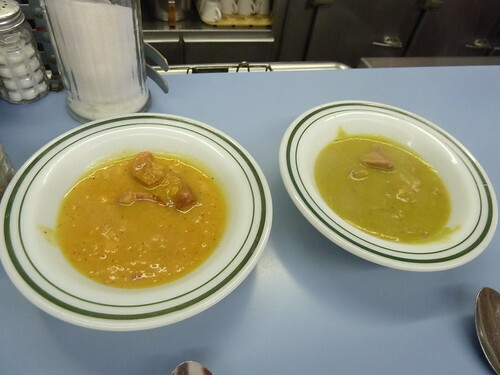 Everything was just as good as it looked, just as good as you could imagine it would be. “There are lot of peectures of us on the eenternet,” the wife said, smiling in a slightly-mystified, but good-natured way. Yes, and now there are five more. 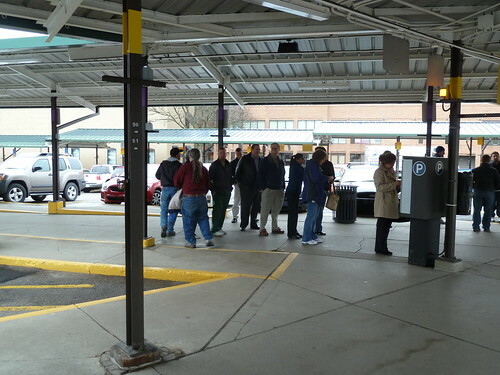 Yes, Chicago, there is an automated parking system even more cumbersome and incomprehensible than yours. Welcome to Ann Arbor, Michigan, where parking near Zingerman’s takes 5 minutes to figure out, even for locals, apparently. Next time, find street parking, is my advice. 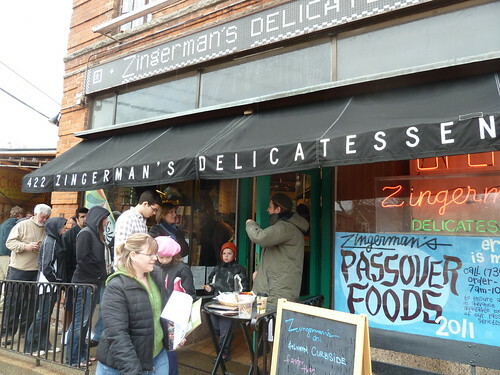 And there will be a next time because Zingerman’s is, of course, Zingerman’s— a deli and fine foods shop to make any big city in America jealous, located in a college town in the midwest. Actually Zingerman’s is a complex of shops and bakeries now, but the original deli is still there even as the space in between two of its buildings is being excavated for a third (meaning that you order in one building, and they walk your food over to the other through a construction site, the sort of thing that would appall you in Chicago, but just seems adorable here). The rows of cured sausages intrigued me, the fact that many of them were from the supermarket brand Columbus less so (even if they were its higher end line), but when she returned with my prosciutto-more-expensive-than-gold, I asked for some help selecting more unusual things, and wound up with a pretty good Spanish-style chorizo from Fra’ Mani and a really excellent wild boar sausage from Creminelli. 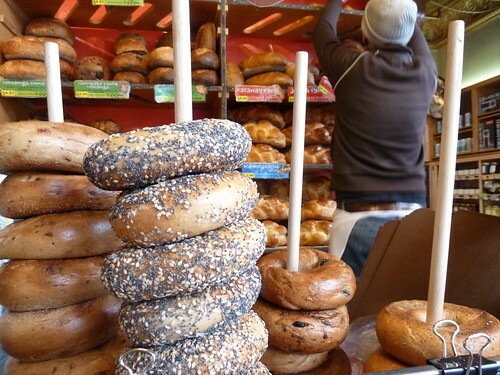 My deli purchases in tow, I examined the bake shop. I’ve only ordered from the bake shop once, to be sent to someone else; the prices are so high once shipping speedy enough to keep things fresh is included. My feeling about the bakery is, well worth picking up if you’re here but not necessarily so great to be worth shipping for someone in Chicago. A nice crusty hunk of brown miche was tasty, but locally you could get better for less at La Farine; likewise a pecan-raisin bread, which was very nice but not better than Fox & Obel’s. What was really excellent was the hot cross buns made for Easter, which had real brioche-like texture and tooth. In the end we checked out with $200 of fine stuff and a picnic which would keep us from stopping at some fast food joint on the way back, plus new deli T-shirts for the kids; a stop well spent. 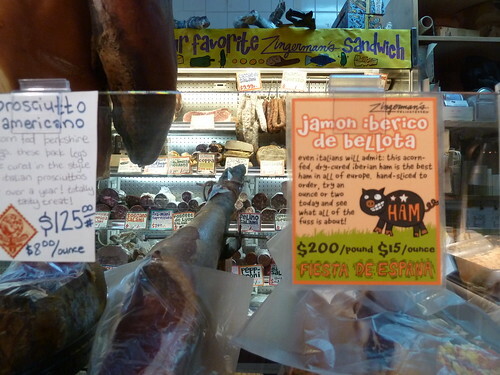 And how was the $125/lb. 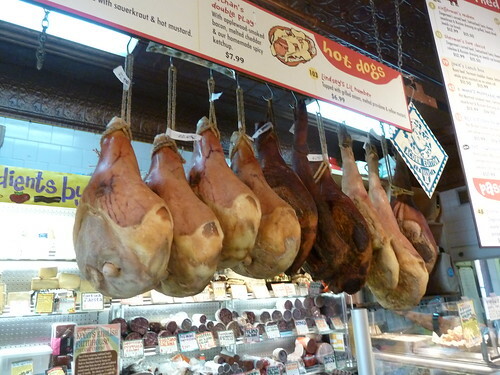 Acorn Edition prosciutto? Well, it’s pretty wonderful, but I’ll tell you. 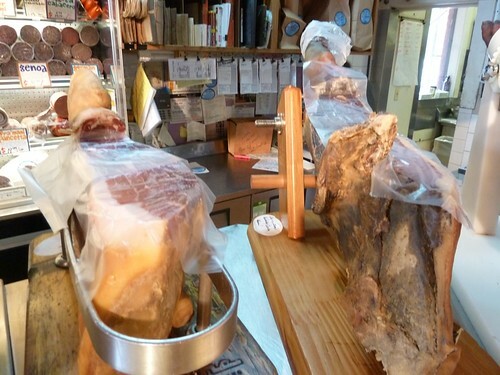 From ordinary mass-produced prosciutto to La Quercia is a leap in complexity and subtlety, you feel like doors have been opened and your prosciutto palate has been expanded in all directions. From La Quercia’s standard product to the organic green label is another such leap, introducing a cheesy funkiness that’s rich and profound. And from the organic green label to the Acorn Edition is even more of that cheesy funkiness, that lactic bite dialed up to 11— but it’s not a qualitatively different or more complex experience. So for me, as much as I enjoyed finally tasting the Acorn Edition, the organic green label, which you can buy a whole ham of (around 15 lbs.) for $270, is the best deal and the one that gives you the greatest experience for the price. 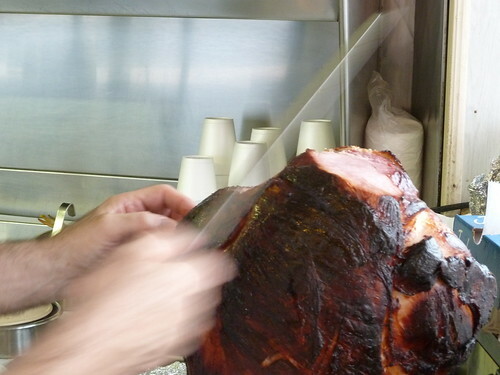 Not that I regret my $30 package of ham one bit— in fact, I may go have to have one of the few remaining slices right now. Carr Valley is apparently actually larger than Roth-Käse or any of the others we visited, but scattered across several plants, so it has the feel of a smaller cheesemaker— at least when you visit its original building, built over the decades around a core that dates back to the early 1900s. Unfortunately, Sid Cook, its master cheesemaker, was out of town and only made an appearance in a video dating back to 1996. 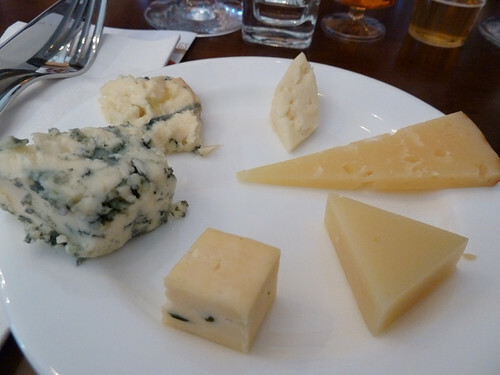 But we had a nice tasting of everything from cheese curds to some award-winning washed rind cheeses; I particularly liked the cow-sheep-milk blend Benedictine, a triple cream called Creama Kasa and another called Casa Bolo Mellage. 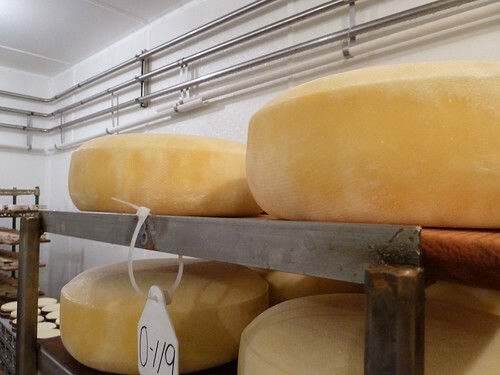 We did learn one amusing factoid about cheese at Carr Valley: you know why the traditional colors for the wax casing on cheddar are clear or white for mild new cheddar, red for a more aged cheese, and black for sharp, very aged cheddar? Because if they sat around without selling for long enough, red will cover a white wax coating, and black will cover a red one…. Cheesemaking was already finished for the morning by the time we made it to Cedar Grove in the town of Plain (a bit redundant as a name for a place in the midwest, it seems to me). And hey, we’d seen cheesemaking already anyway, so owner-cheesemaker Bob Wills took us to see his other pride and joy: an elaborate water purification system which runs the waste water from the cheesemaking process (rich in nutrients, since it started as milk) through a series of tanks where natural processes purify it to the point where it can safely go into the drains. 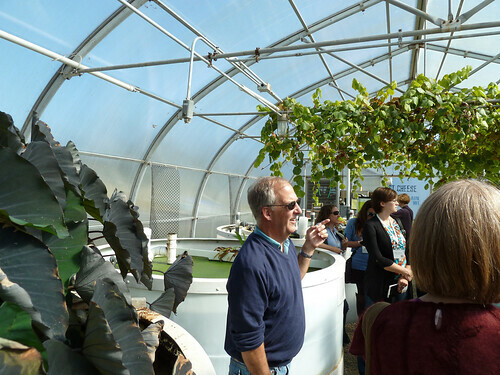 Interestingly, he says not only does it cut the costs of dealing with water on its way out the plant… it seems to have made everyone in his plant think harder about water and use it more carefully and less wastefully, cutting his water bills on the way in, too. And in the summertime, they come out here and snack on the tomatoes and grapes. 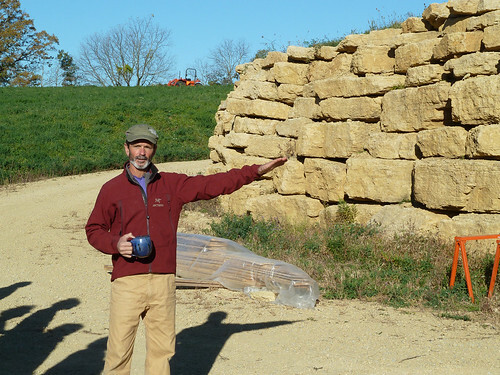 Wills is a strong advocate for cooperation between cheesemakers, and often allows other cheesemakers to use his facilities to make cheese and to experiment with new recipes, treating his plant as a kind of entrepreneurial incubator. 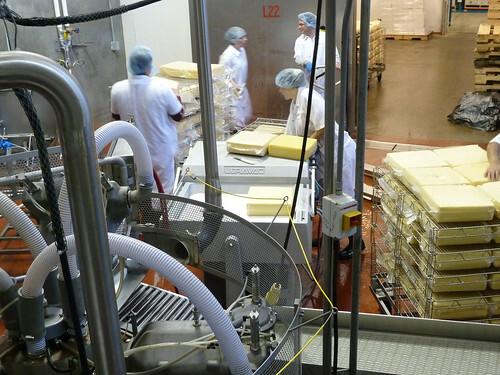 (He contrasted the Wisconsin cheesemaking attitude with what he saw on a consulting trip to Honduras, where each family cheese plant was protected by armed guards.) He made it clear that letting Willi Lehner, say, work in his facility and observing him at work was as much a benefit for him as it was for Lehner. We tasted some cheese at his counter— he just grabbed it from the fridge and started cutting it up— but to be honest, by this point I can’t remember what we had, other than a water buffalo mozzarella which he had just made for the first time. 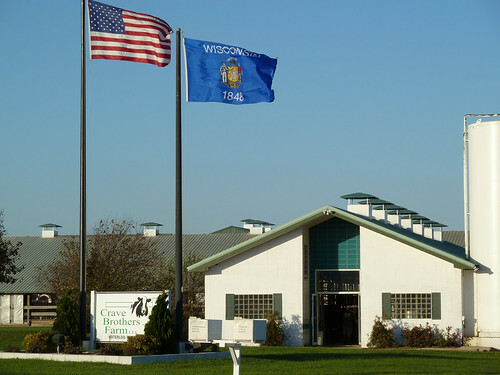 (The farm, the only water buffalo herd in Wisconsin, is right across the street.) The texture was too hard, but he admitted he’s working without actually having been to Italy to try authentic examples of the cheese, so keep an eye on this one, it will no doubt get better. 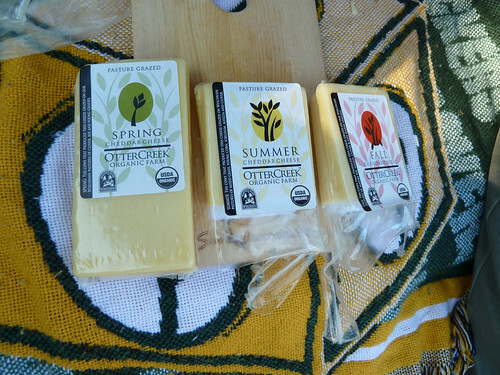 I was especially excited to visit Otter Creek, since I’ve been buying their cheese at the Logan Square Farmer’s Market for some time (and wrote about it here). I didn’t know the half of it. 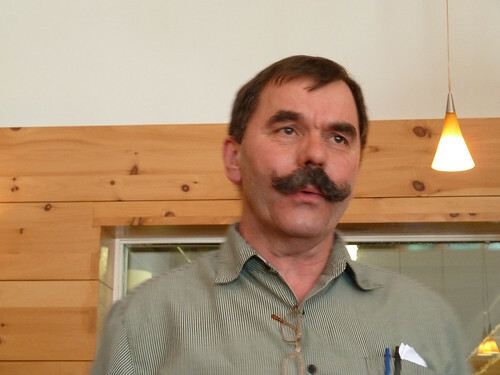 The owner of Otter Creek, Gary Zimmer, is a tireless character preaching his style of farming, which to the extent that I could take it all in a rush of enthusiasm, seems to be organic, rotational farming carried out very intensively to ensure the presence in the soil of all the minerals necessary for health and growth… and involving moving the cattle around a lot so they’re eating the right nutrients at the right time of day and year. Zimmer’s manager in much of this is his son-in-law, Bartlett Durand, who also has a shop selling local foods nearby, and he treated us to a vertical tasting of their seasonal cheeses, produced from the milk at different times of year, in a tasting room consisting of a Packers blanket thrown in the back of his hatchback. This was the first time I’d tasted more than one side by side and you could definitely taste its evolution— from more floral in spring to more dense-tasting and sharp in fall. 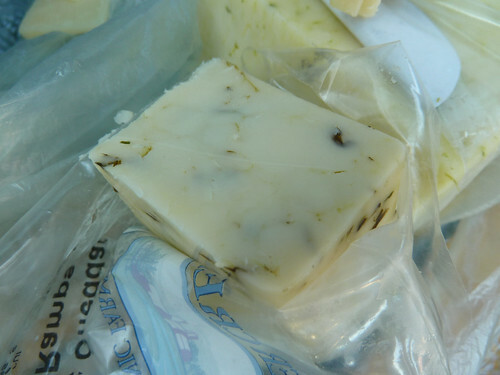 We also tasted their spring cheddar studded with ramps, which has a wonderful wild flavor to it quite different from the usual flavored cheese made with supermarket vegetables in it. One especially interesting thing we learned from him: happy cows don’t moo, mooing is basically grumbling. By that measure, Otter Creek is an unusually quiet and contented farm. 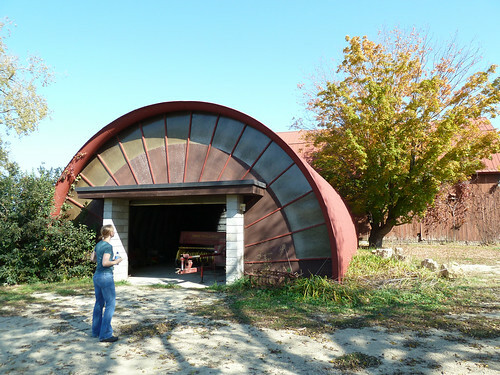 This Otter Creek Farm property (there are several) belonged to one of the architects from Frank Lloyd Wright’s Taliesen. Could you guess from this barn? 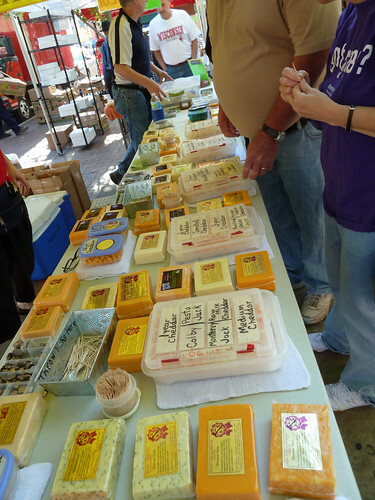 The last part of our cheese junket wasn’t another cheesemaker or farm— it was the Dane County Farmer’s Market held each Saturday around the capitol square. 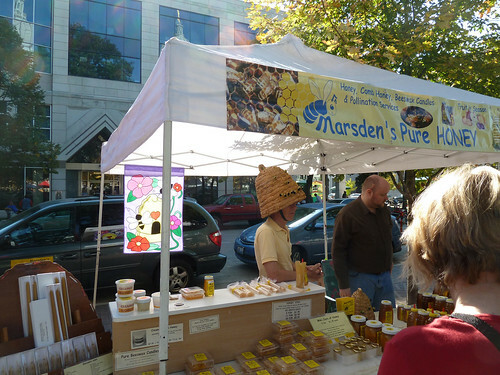 I’d always heard it was bigger and better than any of our Chicago markets, much as I love them. 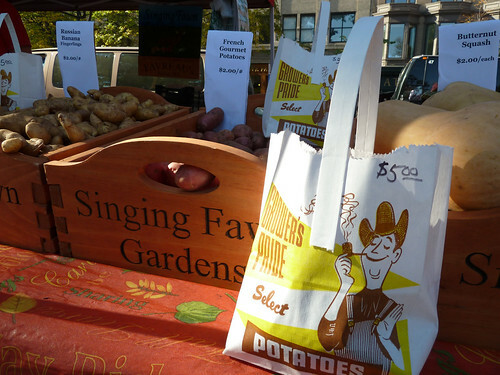 But I never realized how much bigger— any one side of the capitol square would make an exceptional market in Chicago, it was the first market that ever exhausted me before I exhausted it. 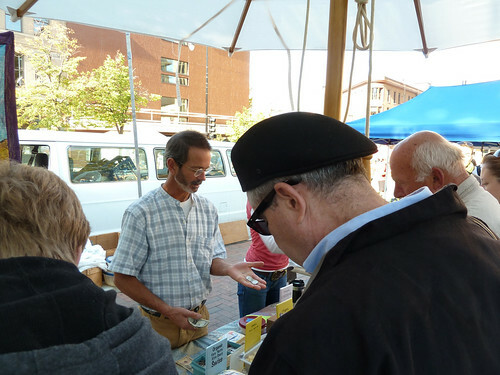 We saw many of the cheesemakers we’d met or tried there, as well as an astounding array of produce vendors, sausage makers, bakers, doughnut makers, everything. It was really a revelation. Trisha, a chef in our tour group, worked this day at L’Etoile, proving they really do shop the market as she pulled the official L’Etoile little red wagon. Hook’s table, with easily 30 cheeses to sample. 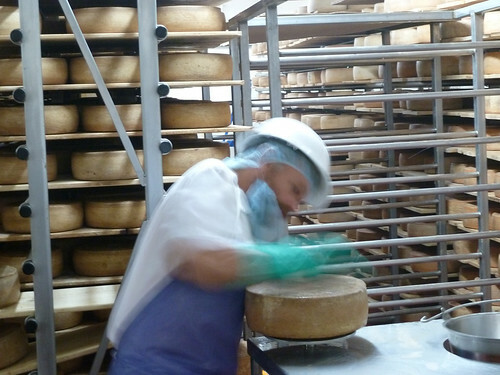 Hammond buys cheese from Willi Lehner. 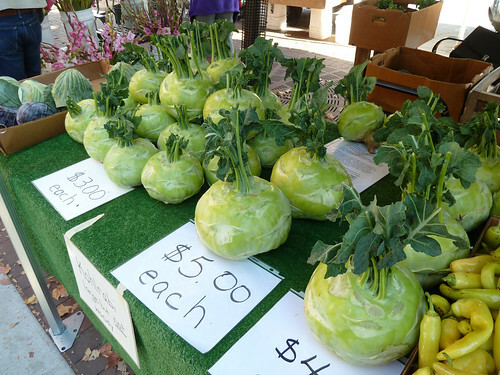 And Cooking With Amy, hilariously, zeroed in on the same monster kohlrabi I did. The cliche, of course, is that urbanites are full of radical ideas and unconventional thinking, while people in rural areas are as complacent as cows. In reality the stereotype more likely runs in the other direction: the societal pressure of city life largely imposes homogenized behavior on us urbanites, but give a man a little land and the freedom to play around on it, and in no time he’ll have built an entirely new way of living powered by cow dung and leftover whey. (You think I exaggerate. Just wait.) 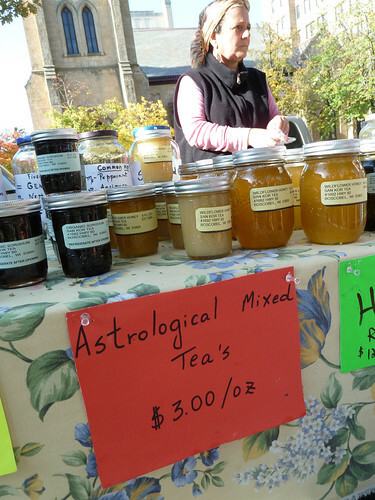 I’m always amazed by the practical fecundity of rural entrepreneurs, who sniff out new ideas from farms half a world away and promptly put them to work on their land, over and over. 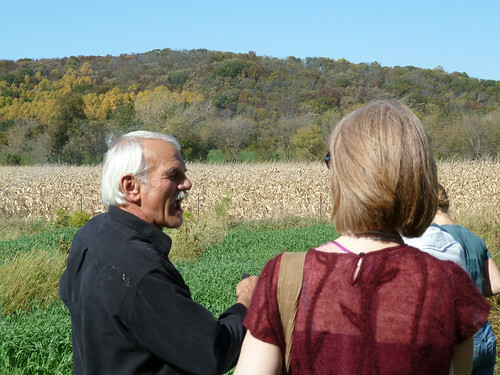 Admittedly, the rural folk I tend to meet are ones who tend to stand out for something interesting they’re up to while raising food, and are surely outliers to some extent, but still, you could drive around for three days meeting cheesemakers and milk producers, and learn something completely new and different at every stop. 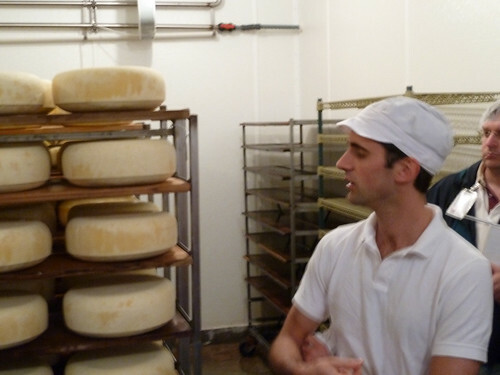 We visited seven cheesemakers within 90 minutes or so of Madison, and though the facilities and processes were largely the same, the approaches were so different and interesting in every case that it never got old, or at least, after starting with the same basic equipment, it soon went off in its own direction reflecting the philosophy of the cheesemaker involved. 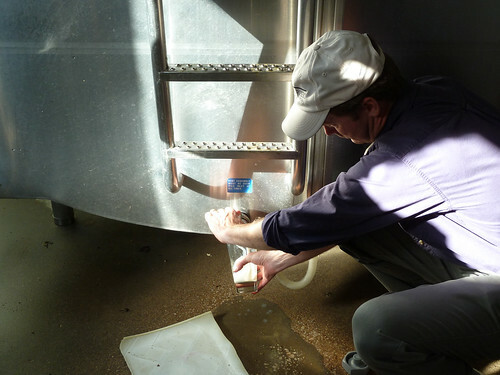 A good example of how these cheesemakers reflect different philosophies peaceably: at one cheesemaking plant, Cedar Grove, we were treated to a pretty firm attack on the whole raw milk craze by certified Master Cheesemaker Bob Wills, who clearly thinks the sanitation issues (and financial pain of throwing out whole batches that test as contaminated) far outweigh any positive benefits. 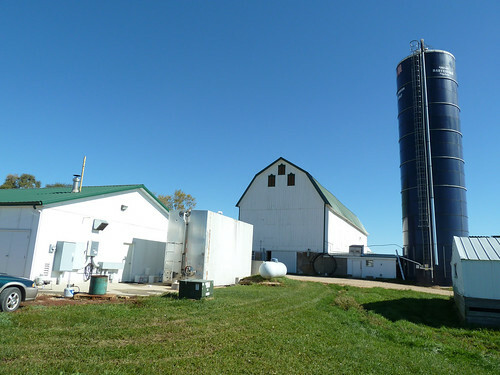 At the very next stop, Otter Creek Farm, we… tried raw milk ourselves, fresh from the tank and the cows half an hour before. (No one either died or felt suddenly reinvigorated.) 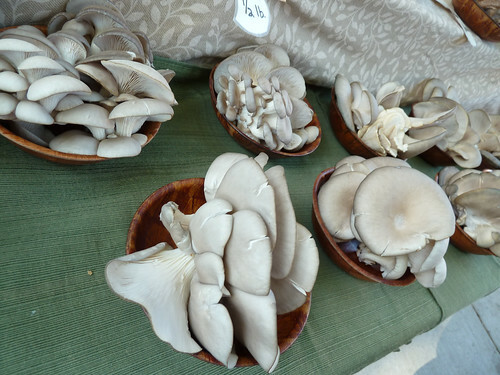 And we were treated to an equally vigorous opposing presentation of the virtues of this most natural of products. 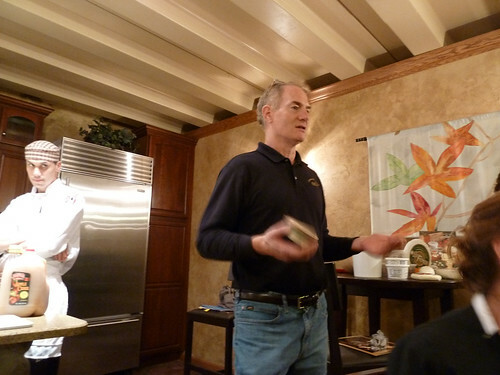 Now, guess who actually makes Otter Creek’s cheeses for them? Bob Wills, at Cedar Grove. Here and in a followup post will be the seven stops we visited; you wouldn’t be able to just walk in and get the same tour, but nearly all of them have a store which you could visit, which might give you at least a little opportunity to see how it’s made, just a few feet away in many cases. 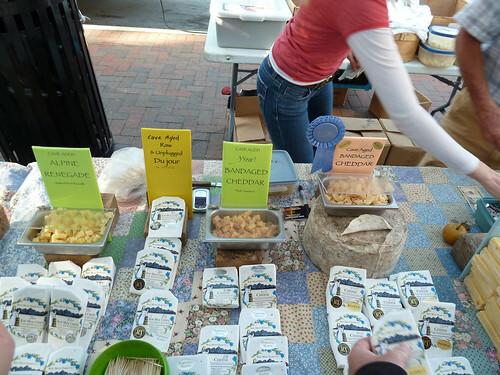 Or you could taste their cheeses via shops such as Pastorale and Provenance in Chicago, or in Madison at the Dane County Farmer’s Market and the cheese shop Fromagination, located on the capitol square. 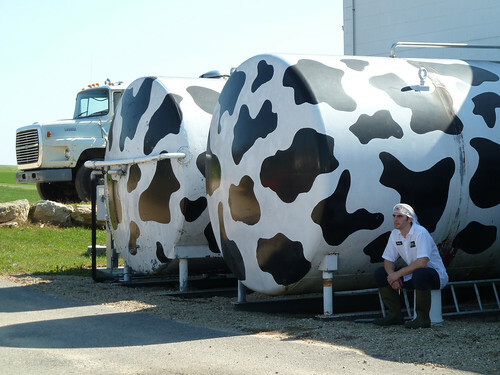 Crave Brothers— not a cute foodie name, they really are brothers whose last name is Crave— has a thousand dairy cows at a farm big and industrial enough that we drove our bus through the barn, as if it were Cow Country Safari. This is a big operation with little of the romantic image of the Old World cheesemaker to it; the endless rows of high-production Holsteins who are milked three times a day (other farms consider two more humane, though the cows may not really mind since they will try, on occasion, to get back in line for another go-round) make that clear enough. And George Crave said that they got into making the cheese they do— mostly fresh mozzarella, including private label for, it was hinted, a certain yuppie grocery chain— purely as a business decision, going to distributors and asking them, what did they want a new supplier for, that would provide the margins the Craves wanted? 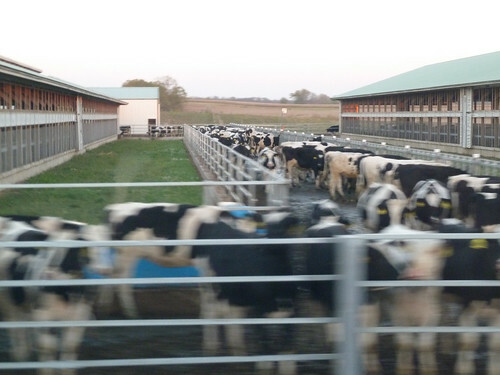 That said, there’s nothing wrong with well-managed bigness per se, since for one thing it afforded them an opportunity to partner with an energy company on a system that processes the manure the farm produces and burns the methane, producing enough power to run their entire farm and several hundred homes besides. This not only uses that much less of some other power source, but gets rid of the giant-poop-lagoon problem common to large animal operations. 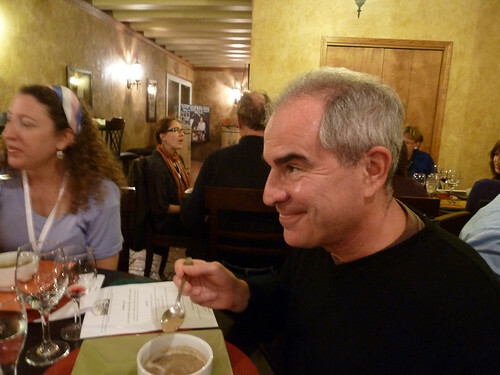 Business is good, clearly, to judge by the winery-like tasting room in which we had dinner. But in time they felt the urge to make something more artisanal like some of their neighbors, and they began working on an authentic Münster-style cheese. What they got, however, was stinkier than they thought the market could bear, and so they went back to work creating what struck me as kind of a deodorized American take on stinky cheese— Les Freres, a soft cheese with a kind of nuttiness and something resembling funk, yet without the foot smell of a truly stinky cheese. That makes it sound like it’s dumbed down, but the combination of this nutty, gently funky cheese baked with wild mushrooms was actually pretty wonderful. 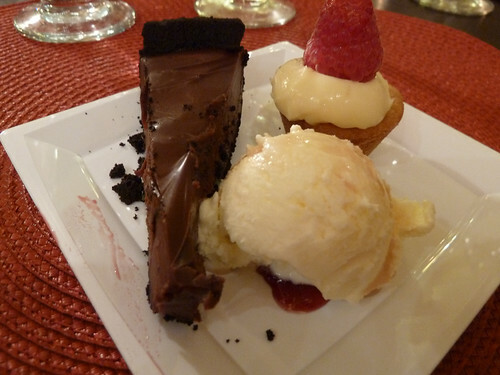 Likewise, their mascarpone, put into various desserts, was mild on its own but elevated the sweet flavors with its cheesey tanginess, and made for excellent sorbet and a lemon cream filling, among other things. We got plenty of romance the next morning, starting at Bleu Mont, run by Willi Lehner, famous for his cheese cave— the only “cave” of its kind in Wisconsin which is actually underground. Carved into a hill, it looks like a hobbit house, befitting the somewhat elfin Lehner, a thoughtfully serious man of Swiss parentage whose property is dotted with solar panels, a new wind turbine (the previous one fell in a storm) and other signs of determined self-reliance. 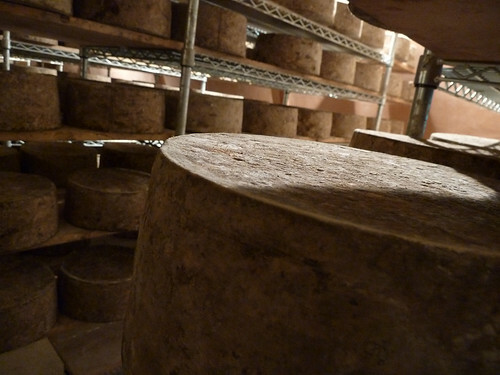 It was in Lehner’s cave that I got my first blast of what I’d come to know as the smell of artisanal cheese: a sort of sweet, Band-Aid crossed with wet plaster scent in the air. 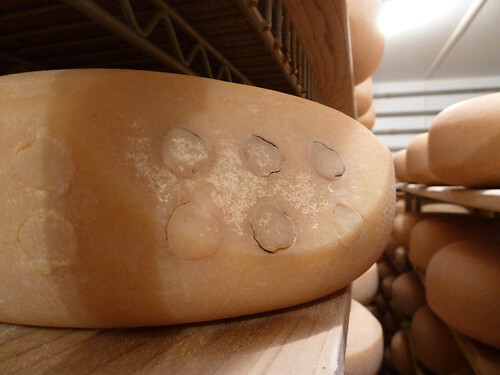 Lehner had experimental batches of various things around the edges of his cave, but his main cheeses were two aged raw milk cheeses, one called Alpine Renegade and one a bandaged cheddar, which he sells at various ages at the Dane County Farmer’s Market. 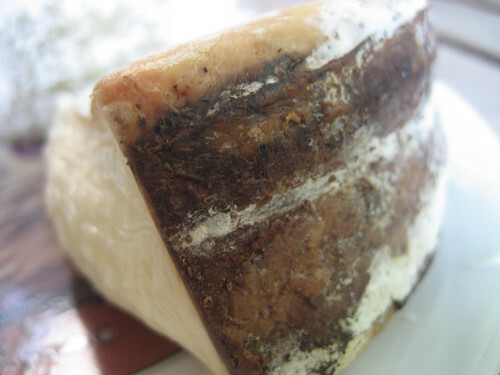 I especially loved the latter, hard and tart and concentrated, studded with crystals and with a distinct chalky-cave taste around the outer edge, and bought a chunk from Lehner at the farmer’s market a few days later, which I will nibble at carefully for weeks to come. 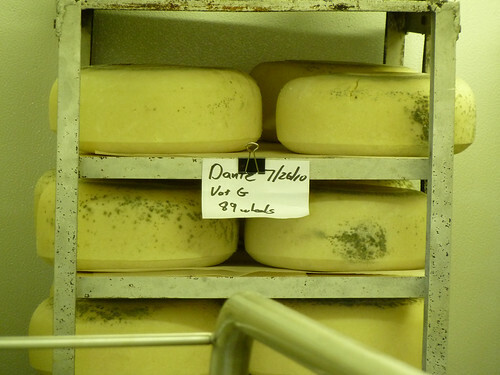 Lehner’s only facility is his cave; he makes his cheeses at other plants such as Cedar Grove, and his milk comes from Uplands, another dairy whose artisanal dedication is obvious (for one thing, from the ribbons and medals on the wall; their signature cheese, Pleasant Ridge Reserve, has won best of show three times at the American Cheese Society, which is twice more than anyone else ever). 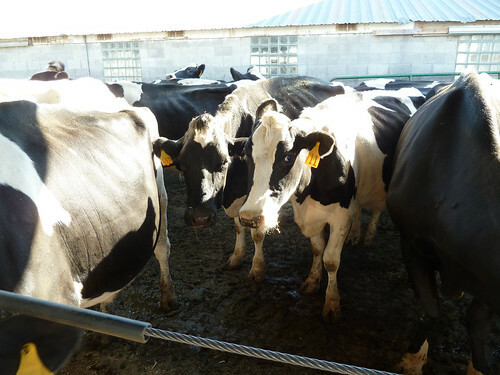 As a farm they feed their cattle by rotational grazing, which means among other things, that when growing season is over, so is milk production. 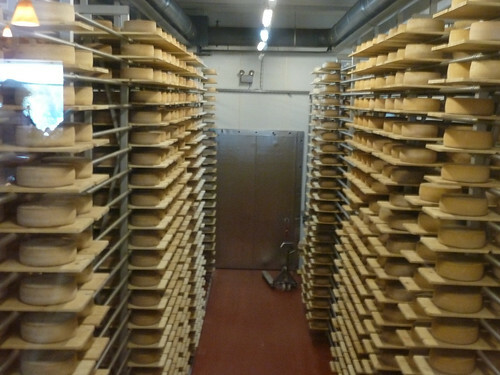 So we saw them close to the end of their cheesemaking season— not a concept that would have any meaning at a big industrial facility, but plainly essential to their vision of how to make the best cheese. I liked Pleasant Ridge Reserve, but after the Beethoven mouth-blast of Lehner’s bandaged cheddar, its subtlety and undeniable balance seemed admirable but less of a knockout to me. Maybe that’s what the judges in a competition like, though— subtlety. I was more intrigued, in fact we pretty much all were, by a camembert-looking cheese to be called Rush Creek Reserve which should be available in another month or so. We hinted broadly at our willingness to be early tasters of it, but all we got was stickers— the labels for the packaging, coming shortly. 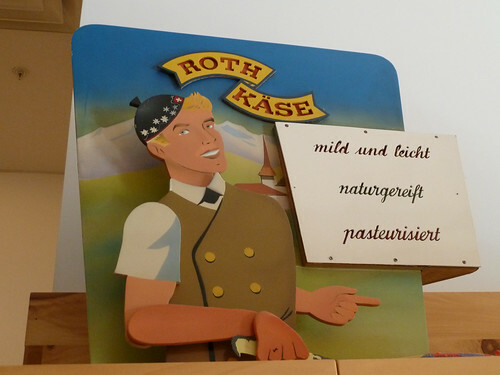 After two examples of artisanal cheesemaking at its most artisanallish, Roth-Käse, a venerable Wisconsin cheese company (founded 1863) recently acquired by the Swiss conglomerate Emmi, was a blast of industrial reality. My first impression— possibly a bit crabby as we were behind schedule for lunch— was that they seemed much more interested in sanitation than, you know, cheese. (To be fair, I think our guide was stalling while waiting for the first half of our group to move on.) 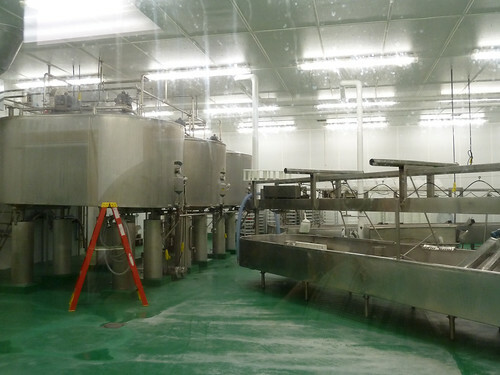 But certainly it’s a big, shiny steel cheese plant, proud of its technology (though we never did see the robots who move cheese wheels around in the two-story cave) and dedicated to producing a consistent industrial product. Even so, there was evidence of a human touch here and there. 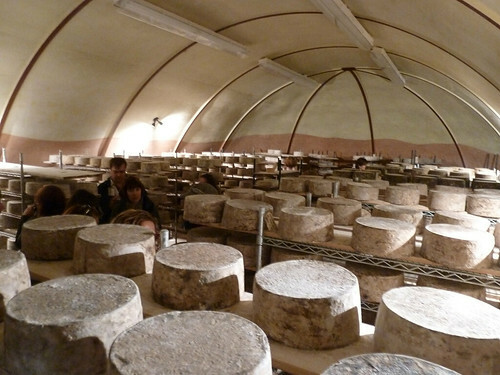 After passing through the various cheesemaking areas, we descended into the hall with the caves, which boomed with echoes of industrial noise and released blasts of steam like the Seventh Circle of Cheese Hell. 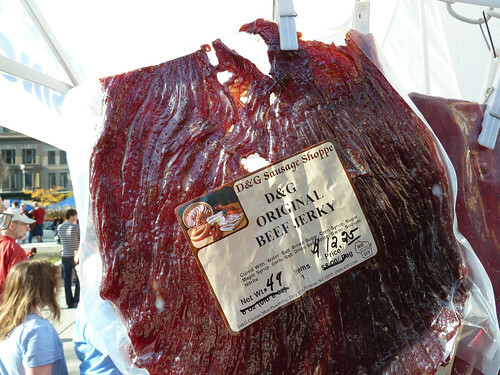 And there, in the depths, the rinds were washed by hand by an employee who hoisted two of the huge wheels at a time, dropped them on a table with a resounding boom, wiped them with the culture and then dropped them back onto the shelf— all in a flash, and with a kind of brawny Teutonic relish that seemed to have walked out of an Upton Sinclair novel. And then there was lunch. Our main course was fondue (ah, spared from going to Geja’s for another decade), but before that, we had a tasting of some of Roth-Käse’s cheeses along with a variety of accompaniments— a plate of different foodstuffs, and a series of glasses containing everything from New Glarus beer to a small production kirsch one of the chefs had brought back from a recent Swiss trip. 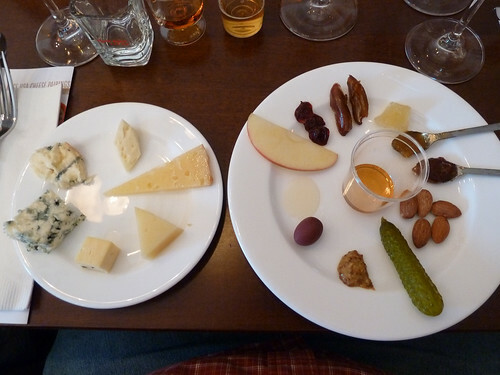 It was fun to try, though I have to admit, I didn’t come to any deeper conclusion about cheese pairings than that just about anything sweet goes well with just about any cheese. 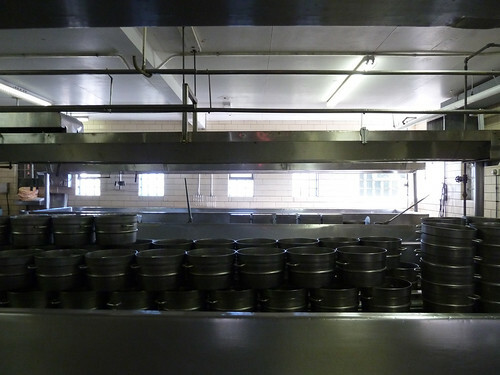 Ironically, the gruyere that is the plant’s main reason for being was not particularly admired, by me or anyone else. But I very much liked Valfino, a soft cheese (at top) which took a first at the American Cheese Society last year, and the horseradish havarti at bottom. Best of all were the two blues— a creamy Buttermilk Blue, top, and Moody Blue, which is very lightly smoked. Both were terrific (and I was happy to note that both are available at Whole Foods). 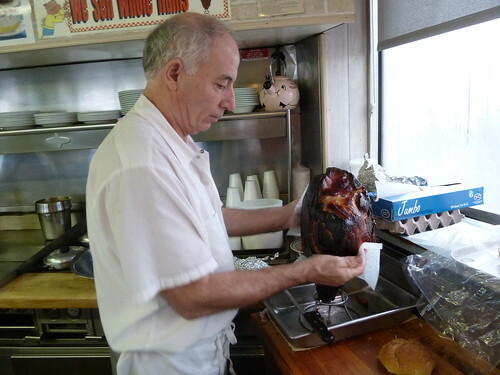 This gracious lunch concluded with our chef demonstrating another of his skills: yodeling. Philip Potempa of the Northwest Indiana Times filed daily from the bus while the rest of us goofed around; here he is on Friday and Saturday. First in a new feature in which we eat cheese, and blog cheese. I’ve decided I need to get more serious about cheese. By which I mean, there’s this cheese scene in America, and I basically only buy cheese by type— hard, soft, goat. Put them in front of me and mmmnnnummmnmm, I eat, but I don’t analyze. I don’t remember what I liked, and why. I need to take cheese more seriously and thoughtfully. Hence this new feature, in which I’ll write about specific new cheeses in our fabulous cheesy era of great cheese. 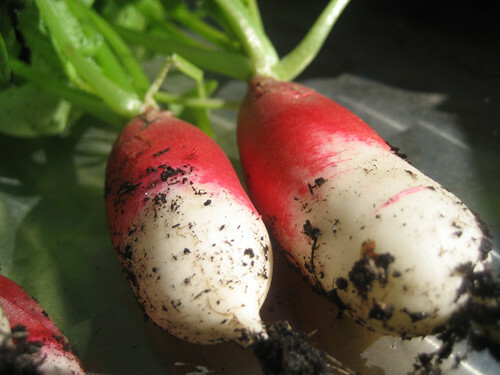 But first: radishes. I went to look at my Earthboxes the other day, and wow, French breakfast radishes were practically forcing themselves out of the ground, like mandrakes getting ready for a good scream. I don’t think the miracle of growing had ever been quite so forcefully impressed upon me— a couple of weeks ago, mud, that has somehow been turned into this bright pink and white thing. I think it’s the color that really struck me. I’m used to green coming out of the ground, but this was like something made of bright plastic had grown there. It was like I was harvesting Christmas ornaments, or Barbies. 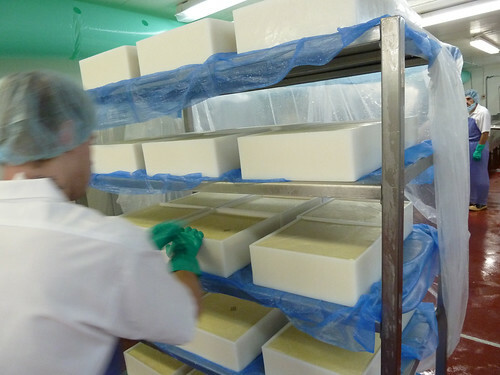 Constant Bliss is based on a Chaource recipe, which we modified to suit our production schedule and cheesemaking facility. The result is a cheese which hardly even resembles a Chaource. It is a slow ripened lactic curd made only with fresh, right out of the cow, uncooled, evening milk. 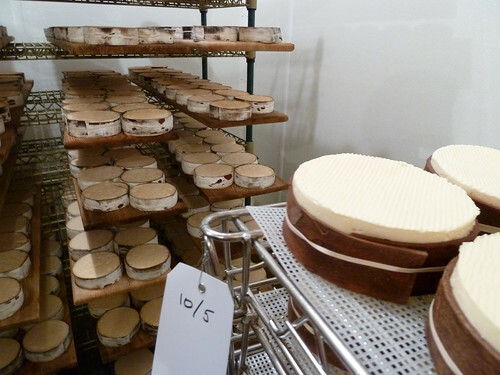 We actually begin the cheesemaking process before the cows have finished milking… It is aged 60 days before it leaves the farm, and is a ‘sell it or smell it’ item for retailers… We named Constant Bliss after a revolutionary war scout killed in Greensboro by native Americans in 1781. Because nothing says cheese like death by tomahawk. 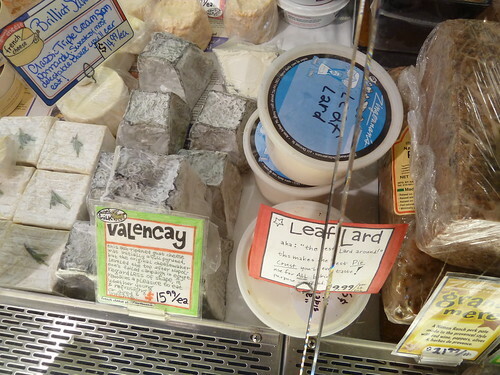 At right, with the orange rind, is another Jasper Hill raw milk cheese, Winnemere (or is it Winnimere? There seems to be no consensus online), made seasonally (the season just ended, actually) and washed with raspberry lambic beer and wrapped in spruce bark. 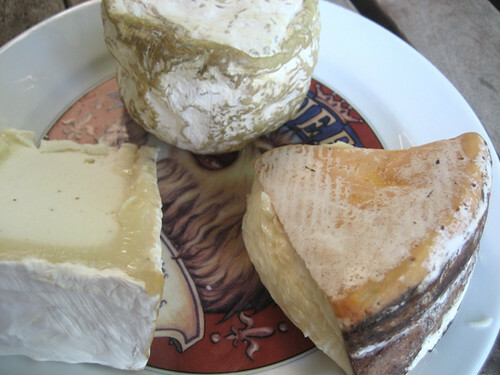 At left is Truffle Tremor, a soft and creamy goat cheese with bits of black truffle in it, from the well-known goat cheesemaker Cypress Grove in Arcata, California. Let’s start with the latter. Truffle is an easy flavor to use to dress up foods, or to overdress them, and it’s often synthetic, so it’s nice that the truffle here is both subtle and seems complex and multidimensional—in a word, real. I don’t think this is a brilliantly made cheese, but it’s certainly a good one, and high quality as flavored cheeses go. Constant Bliss instantly seems to have greater depths, to have more going on. The simple gooeyness of the camembert-like texture begins to develop, like a Polaroid, into an almost tomatoey ripeness. It’s a strong cheese, not in the stinky sense, but just in that it refuses to go away for a while, hanging around on the tongue showing attitude. You taste little fruity hints of the lambic and the spruce at first. The creaminess settles in on your tongue for a long night of watching B.J. and the Bear reruns on MeTV, when suddenly you smell—hey, is that vanilla? Who vanillaed in here? And you’re looking at Winnemere and it’s going what, I don’t smell vanilla and you’re saying dude, you’re totally vanillaing in my mouth. Winnimere seems to have attracted a lot of excitement in the cheese world, as most things only available half the year do, and rightly so. 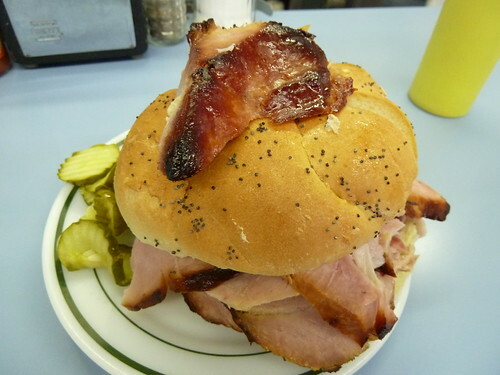 It’ll probably be gone in a few weeks, so grab it now and be prepared for it to do whatever it wants to in your mouth.